There are two principal methods of investing in a mutual fund – lump sum (one-time investment) and SIP (Systematic Investment Plan). They are closely related to each other and go hand in hand. A Systematic Investment Plan (SIP) is a smart way of investing money in mutual funds. SIP allows you to make smaller periodic investments (usually on a monthly or quarterly basis) rather than a lump sum or one-time investment e.g. it (SIP) enables you to invest Rs. 10,000 ten times over a period of time instead of paying Rs. 1,00,000 at one single instance. This ensures that an ordinary person with low income can also invest in mutual funds. He or she can start investing regularly in small amounts starting from Rs. 500 or Rs. 1000 rather than making a large one-time payment. For this, you will be required to follow some simple steps. Firstly, based on your nest egg, choose the amount you can invest periodically into the target mutual fund. Once you have mentioned the amount, it remains the same irrespective of fluctuation and market volatility. For instance, if you have decided to invest Rs. 10,000 per month through SIP into an equity MF, then on a specified date, let’s say, 5th or 15th of every month, your account will be debited with Rs 10,000. The net asset value (NAV) of the fund will change every month according to the fund's performance and existing market conditions. By investing regularly in SIP, investors automatically buy more units when the NAV is lower and fewer units when the NAV is higher. For example, let’s say, you will start a SIP of Rs 10,000 when the NAV is Rs 275.75 per unit, you can buy 36.25 units (Rs 10,000 / Rs 275.75). Next month, if the NAV goes up to Rs 470.75, then you would accumulate 21.24 units but if the NAV drops to Rs. 246.13, you would get 40.63 units. There are flexible SIPs, too, which allow investors to change the installment, depending on the prevailing market levels. Moreover, there is no compulsion on any investor to continue SIP investment for long period of time, he/she can discontinue the plan any time. When the entire amount is invested in a chosen mutual fund at one go, it is known as lump-sum investment. It is mostly preferred by more experienced investors who have a better understanding of the markets and current valuations or investors with the financial advisor who understands equity market behaviour. Valuations of the shares and markets are low. When markets Price to Earnings (P/Es) ratio and specific stock Price to Earnings (P/Es) ratio are low. And also when markets correct sharply i.e. when stocks, index prices drop sharply or when there is a panic situation in the market environment. Many investors may panic when the market is on a decline or edging lower and may withdraw the investment or stop investing in equity mutual funds. However, these are not beneficial for the investors in the long run. If you are a well educated investor yourself or you have an expert financial advisor, you will, in fact, invest more money during this period for you to get overall high-weighted average returns over a longer period of time. If you have a good understanding of the equity market and have no problem to take the risks associated with market volatility, you can make a lump sum investment in the equity market. 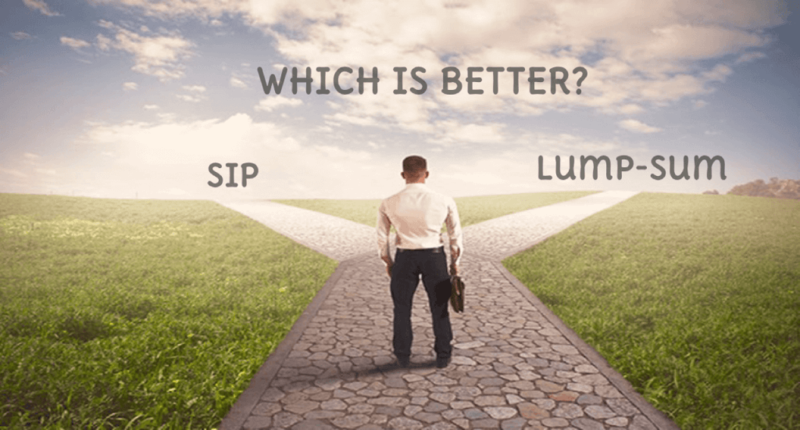 The choice between SIP and lump sum investment basically depends on investor’s investment goals – long term, mid term and short term - and risk appetite. It is imprudent to say what is a wrong way or right way. Be that as it may, the wise strategy would be the combination of lump sum and SIP. But, again, sound knowledge of the market and due diligence will increase your chances of success. The key to successful investing is very simple - buy more units when the price is lower to reduce the average cost per share and sell when the price is higher, and also follow strict investment discipline.